Swati Roy, co-founder of Eureka!, an independent children’s bookstore in Delhi, talks about the highs and lows in her workday, and what makes it all worth it. My day starts at 6:00 with two cups of tea, three newspapers and a dog to walk. These days the first two take up more time as my Bengali-German Shepherd refuses to go out without a monkey-cap. And I will be damned if I share mine with him. My store-office is 7.5 mins away from my house and the godown/warehouse 12.5 mins away. Most days when I dress up in overalls or some such stuff to rummage through the godown I end up with a meeting at the office as some person would have walked into the welcoming store that Eureka is, to discuss a proposal or two. So, at the cost of disappointing a resident rat reader in the godown, I have to move swiftly to the store which is 8.5 mins away. On reaching the store, I may find a distributor waiting for me to reject the umpteenth grammar or mathematics books from yet another South East Asian publisher or another from the endless series of retold classics. Yet another abridged Oliver Twist and you begin to wonder: are publishers taking ‘Please sir, I want some more’ too literally. Suddenly, like a whiff of freshly printed books there arrives a publisher with state-of-the-art printing, fabulous child-friendly illustrations, contemporary, crisp text and you say aah! Now that’s something I could do with a few copies of. Then you suddenly realise Oh No! Can’t have them as the publisher does not understand the commercial compulsions of a small indie, specialist bookstore like ours and insists on very strict credit and payment terms because we are a small indie, specialist bookstore. Suddenly, it does not matter that you have been surviving so many odds in this ever-changing market to stay afloat, giving that personal touch to every customer interaction, trying to give ideas about better distribution or promotion at virtually every industry conference you attend. At the end of the day you are just another retailer competing with the biggies of the world selling DVDS, games, educational toys and stuffed toys (by the way, why can’t stuffed toys be educational too?). This is perhaps where the scouting, researching and reading up for Bookaroo helps. 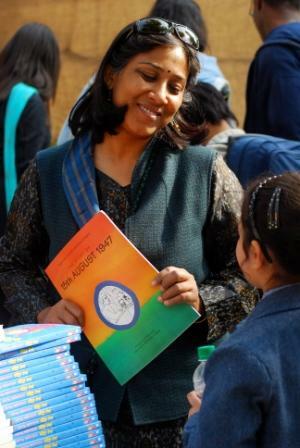 Bookaroo is India’s first children’s literature festival and is 10 editions old now. A typical day definitely has at least a couple – if not more – hours dedicated to working on Bookaroo. Be it sending a partnership proposal, researching on the feasibility of taking it to a new city (the festival takes place in three cities – Delhi, Srinagar and Pune – now), finding out which speakers are free for the next edition, looking for a more cost-effective vendor for one of the services, reading newly-launched books or attending speaker sessions in the city to see how they can fit into the Bookaroo programme. It’s a lot of work but a lot of fun too. The day is never complete without at least a couple of interesting interactions in the store. If it is Christmas-time, there arrive letters to Santa from eager young readers via their parents for the friendly neighbourhood bookseller. Sample this, ‘Dear Santa, could you please give these books this Christmas but keep the letter safely as my mother is very forgetful and loses things easily?’ Which means I save the letter till all books on that list are available. Even as I finish with that, another child struggles with the bookshop ladder, instructs us to hold tight while he stretches at a near-impossible angle and reaches out for the latest Geronimo Stilton (No matter how far and high the Stiltons are, the ladder is forever in use!). Then comes the moral dilemma when a 11-year-old pleads with you to let her mum buy Twilight and the mother looking at me expectantly for approval. What can a mere mortal of a bookseller do? And in all this there is mail from a newspaper waiting to be answered – What is the current trend in Indian writing, What books are children picking up? What is the percentage of sales breakdown Indian versus international titles? So I sit, write clever answers to the questions while the real audience comes in, climbs the ladder and walks away with her choice twice a week. Eureka has another window too – schools. This is where we are able to promote and make visible books of our choice. Books that we love and think children too will love if given a choice. Eureka goes to 40 schools in Delhi and NCR where new books, back lists, prize books and all things books are provided by us. It feels great when a school approaches and asks for recommendations for a reading list, books to give as prizes, or young adult books they can stock ‘safely’ in the library. So, a little time each day goes in school correspondence. On a lucky day one might wrap up by meeting an old customer who is now a strapping young man studying abroad. He may step in with his girlfriend to reminisce how he used to visit the store as a child and attended storytelling sessions or talk about the time he met his favourite author. Do we make money in the store? As an entrepreneur that is an important consideration. Frankly, we make just enough. Here is how. A child rushes in, clutching his pocket money tightly in his fist, looking furtively and frantically for a book that he had hidden behind a stack a couple of days ago. On not finding it he chooses another – reluctantly – and is about to pay for it when I take out his chosen one from our storage box. He pays. We earn. He leaves the shop and smiles back from the door. What a lovely, heartwarming read! Bless you, Swati Roy, Independent Bookseller – long may you continue turning young, impressionable ladies from the likes of Twilight. Swati, the photo reminds me that it’s that encouraging smile of yours that does it, too. What customer, young or old, could resist a book if you suggested it to them? Especially when the books at Eureka are so well chosen, too..